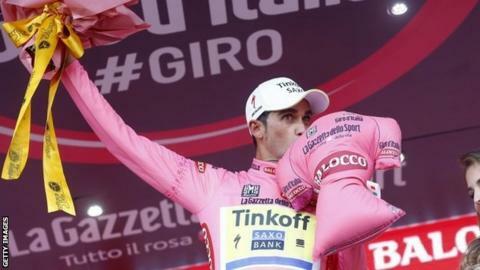 Race favourite Alberto Contador moved into the overall lead after stage five of the Giro d'Italia, which was won by Slovenia's Jan Polanc. Spaniard Contador, who won the 2008 Giro, finished fourth on the first mountain finish of this year's race. The Tinkoff-Saxo rider leads the race by two seconds from Italian hope Fabio Aru, with Team Sky's Australian Richie Porte in third, 20 seconds adrift. "There's still a long way to go. This was just an aperitivo," said Contador. The 32-year-old, who is aiming to become the first man since Marco Pantani in 1998 to win the Giro d'Italia and Tour de France in the same year, finished alongside Aru and Porte, 91 seconds behind stage winner Polanc. Lampre-Merida rider Polanc, 23, had been part of a five-man break and surged clear on his own with around 10km of Wednesday's stage remaining to claim the first major win of his professional career. France's Sylvain Chavanel, who had also been part of the break, just held on for second as Aru, Contador and Porte followed him over the line. Thursday's sixth stage is a 183km leg from Montecatini Terme to Castiglione Della Pescaia featuring flat sections at the start and finish and hills in between. The 98th edition of the Giro ends on 31 May in Milan.